When a new episode of Wrestling Observer Radio appears in my RSS reader, I follow the link to the episode’s webpage. From there I long press on the download link, tap the “Share…” button, choose “Run Workflow”, and tap on Download In iCab. The workflow takes the URL passed into it and makes use of iCab’s x-callback-url support to initiate a download of the linked file. 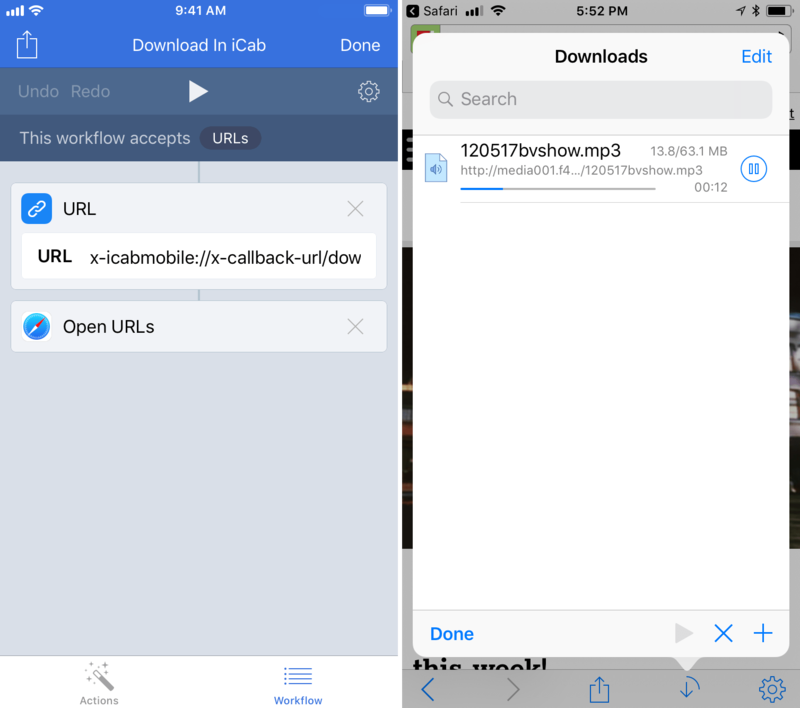 In a few short seconds, the MP3 file is available for me to upload to Overcast’s servers for listening in the app — thankfully, iCab works well with the Files app as a document provider. This workflow is great on the iPhone, but it really shines on the iPad where I have Sidefari setup in split view alongside iCab Mobile. iCab downloads the file while Sidefari is configured to automatically load the Overcast Uploads webpage. Once the download is completed, I can start uploading to Overcast immediately. And when I’m done, I can use the system back button in the upper left to get back into my RSS feeds. This workflow has been immensely useful for me over the past several months. The podcast I use it for is updated several times each week and I follow the steps outlined above for nearly every episode. It might not seem like all the tapping through various menus is worth the trouble, but I can assure you that the alternative methods for performing the same task are much more time consuming and frustrating to use. I originally built this workflow in order to download audio files from the web, but I’m sure there are all kinds of oddball tasks that it could be useful for. I’d love to see iCab introduce an action extension that initiates a download, but until that happens, this workflow is the next best thing.